Description: Motivated seller. This 4 bedrooms, 2 baths chalet offers open floor plan, cathedral ceilings and a lot of natural light. Living room features stone faced gas fireplace and sliding doors to the deck, kitchen with island, utility closet with washer and dryer, central air. Property is in a community with 5 lakes, 2 pools, tennis, 24 hour security, garbage pick up. Closet to many attractions. 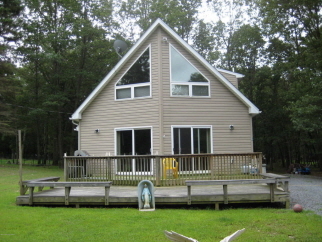 Easy access to interstate 80 and pa turnpike.